As the battle continues in Raqqa, civilians have two choices: flee or die. They lived in Tabqa, a small city on the banks of the Euphrates River in northern Syria. Then occupied by the Islamic State (ISIS, also known as Daesh), Tabqa was also under siege by US-backed troops and being hit by daily artillery fire from US Marines, as well as US-led coalition airstrikes. The city, the second largest in Raqqa Province, was home to an airfield and the coveted Tabqa Dam. It was also the last place in the region the US-backed forces needed to take before launching their much-anticipated offensive against the Islamic State’s self-proclaimed capital, Raqqa. His parents, Muhammed and Salam, had already fled their home once when the building adjacent to their house was bombed, Wassim Abdo told me in a recent interview. ISIS had been arresting civilians from their neighborhood for trying to flee the city. So on that Sunday, the couple was taking shelter on the second floor of a four-story flat along with other family members when a US-led airstrike reportedly struck the front half of the building. Abdo’s sister-in-law Lama fled the structure with her two children and survived. But his parents and 12-year-old cousin were killed, along with dozens of their neighbors, as the concrete collapsed on them. As an exiled human rights activist, Abdo only learned of his parents’ death three days later, after Lama called him from the Syrian border town of Kobane, where she and her two children had been transported for medical treatment. Her daughter had been wounded in the bombing and although the US-backed, Kurdish-led troops had by then seized control of Tabqa, it was impossible for her daughter to be treated in their hometown, because weeks of US-led coalition bombing had destroyed all the hospitals in the city. But reports and photographs from Syrian journalists and activists, as well as first-person accounts from those with family members living in areas under US bombardment, detail a strikingly different tale of the American offensive—one that looks a lot less like a battle against the Islamic State and a lot more like a war on civilians. These human rights groups and local reporters say that, across Syria in recent months, the US-led coalition and US Marines have bombed or shelled at least 12 schools, including primary schools and a girls’ high school; a health clinic and an obstetrics hospital; Raqqa’s Science College; residential neighborhoods; bakeries; post offices; a car wash; at least 15 mosques; a cultural center; a gas station; cars carrying civilians to the hospital; a funeral; water tanks; at least 15 bridges; a makeshift refugee camp; the ancient Rafiqah Wall that dates back to the 8th century; and an Internet cafe in Raqqa, where a Syrian media activist was killed as he was trying to smuggle news out of the besieged city. The United States is now one of the deadliest warring parties in Syria. In May and June combined, the US-led coalition killed more civilians than the Assad regime, the Russians, or ISIS, according to the Syrian Network for Human Rights, a nongovernmental organization that has been monitoring the death toll and human rights violations in Syria since 2011. Located at the confluence of the Euphrates and Balikh rivers in northern Syria, Raqqa was first settled more than 5,000 years ago. By the late 8th century, it had grown into an imperial city, filled with orchards, palaces, canals, reception halls, and a hippodrome for horse racing. Its industrial quarters were then known as “the burning Raqqa,” thanks to the flames and thick smoke produced by its glass and ceramic furnaces. The city even served briefly as the capital of the vast Abbasid Empire stretching from North Africa to Central Asia. Only in the middle of the 20th century, when irrigation from the Euphrates River allowed Raqqa’s countryside to flourish amid a global cotton boom, did the city fully reemerge. In the 1970s, the region’s population again began to swell after then-President Hafez al-Assad—the father of the present Syrian leader, Bashar al-Assad—ordered the construction of a massive hydroelectric dam on the Euphrates about 30 miles upstream of Raqqa. Wassim Abdo’s father, Muhammed, was an employee at this dam. Like many of these workers and their families, he and Salam lived in Tabqa’s third neighborhood, which was filled with four-story apartment flats built in the 1970s not far from the dam and its power station. Despite these agricultural and industrial developments, Raqqa remained a small provincial capital. Abdalaziz Alhamza, a co-founder of the watchdog group Raqqa Is Being Slaughtered Silently, which is made up of media activists from Raqqa living in the city as well as in exile, writes that the local news normally didn’t even mention the city in its weather forecasts. Despite the occupation, Wassim’s parents never tried to flee Tabqa because they hoped to reunite with one of their sons, Azad, who had been kidnapped by ISIS fighters in September 2013. In retirement, Muhammed Abdo opened a small electronics store. Salam was a housewife. Like tens of thousands of other civilians, they were living under ISIS occupation in Tabqa when, in the spring of 2017, US Apache helicopters and warplanes first began appearing in the skies above the city. US Marines armed with howitzers were deployed to the region. In late March, American helicopters airlifted hundreds of US-backed troops from the Kurdish-led militias known as the Syrian Democratic Forces to the banks of the dammed river near the city. Additional forces approached from the east, transported on American speedboats. By the beginning of May, the Abdos’ neighborhood was under almost daily bombardment by the US-led coalition forces. On May 3, coalition warplanes reportedly launched up to 30 airstrikes across Tabqa’s first, second, and third neighborhoods, striking homes and a fruit market and reportedly killing at least six civilians. The following night, another round of coalition airstrikes battered the first and third neighborhoods, reportedly killing at least seven civilians, including women and children. Separate airstrikes that same night near the city’s center reportedly killed another six to 12 civilians. On May 7, multiple bombs reportedly dropped by the US-led coalition struck the building where Muhammed and Salam had taken shelter, killing them and their 12-year-old grandson. Three days later, the Syrian Democratic Forces announced that they had fully seized control of Tabqa and the dam. The militia and its US advisers quickly set their sights east to the upcoming offensive in Raqqa. That same day their bodies were finally recovered. On May 23, his parents and nephew were buried in the Tabqa cemetery. ISIS fighters, in turn, prohibited civilians from escaping the city and planted land mines in Raqqa’s outskirts. Nevertheless, on June 5, dozens of civilians heeded the coalition’s warnings and gathered at a boat stand on the northern banks of the Euphrates, where they waited to be ferried out of the city. Before the war, families had picnicked along this riverbank. Teenagers jumped into the water from Raqqa’s Old Bridge, built in 1942 by British troops. A handful of river front cafes opened for the season. The day after the attack on fleeing civilians at the boat stand, the long-awaited US-backed ground offensive officially began. 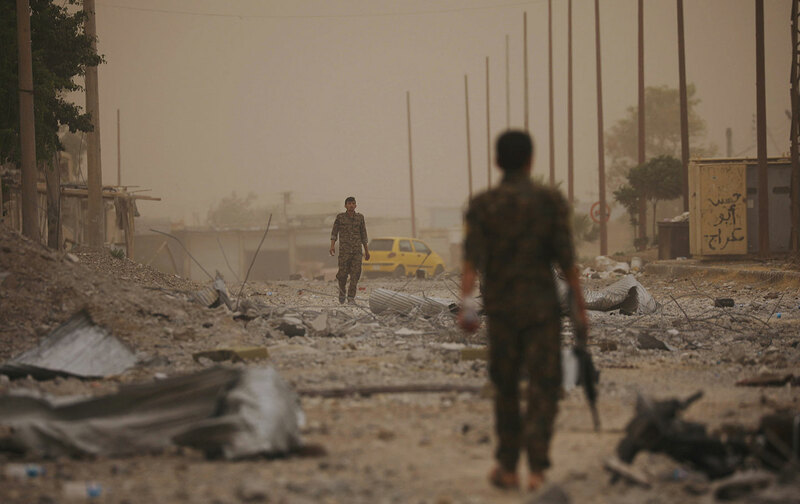 After three years of ISIS rule, Raqqa had become one of the most isolated cities in the world. The militants banned residents from having home Internet, satellite dishes, or WiFi hotspots. They arrested and killed local reporters and banned outside journalists. On the day US-backed troops launched their ground offensive against the city, ISIS further sought to restrict reporting on conditions there by ordering the imminent shutdown of all Internet cafes. Despite these restrictions, dozens of Syrian journalists and activists have risked and still risk their lives to smuggle information out of besieged Raqqa—and their efforts are the only reason most Western reporters (including myself) have any information about the war our countries are currently waging there. Every day, these media activists funnel news out of the city to exiled Syrians running media outlets and human rights organizations. The most famous among these groups has become Raqqa Is Being Slaughtered Silently, which won the 2015 International Press Freedom Award for its reporting on the ISIS occupation and now publishes hourly updates on the US-backed offensive. All this news is then compiled and cross-checked by international monitoring groups like Airwars, whose researchers have now found themselves tracking as many as a half-dozen coalition attacks resulting in civilian casualties every day. It’s because of this work that we know the Raqqa offensive officially began on June 6 with a barrage of airstrikes and artillery shelling that reportedly hit a school, a train station, the immigration and passport building, a mosque, and multiple residential neighborhoods, killing between six and 13 civilians. Two days later, bombs, artillery shells, and white phosphorus were reportedly unleashed across Raqqa, hitting—among other places—the Al-Hason Net Internet cafe, killing a media activist and at least a dozen others. (That journalist was one of at least 26 media activists to be killed in Syria this year alone.) Other bombs reportedly hit at least eight shops and a mosque. 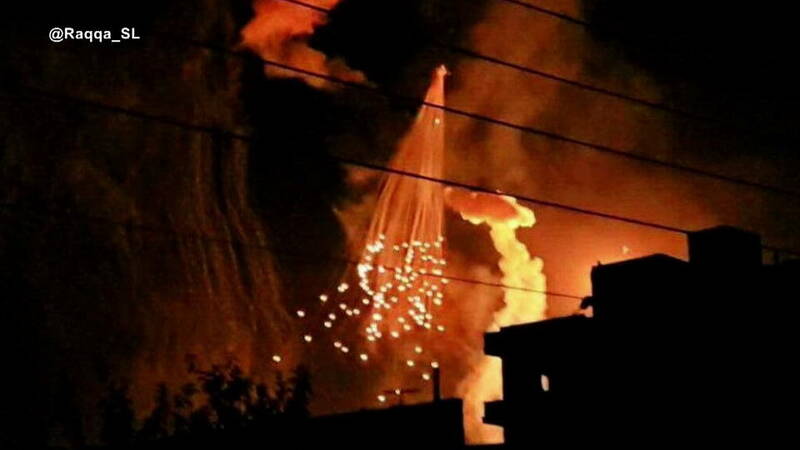 Photos also showed white phosphorus exploding over two residential neighborhoods. Following the reported white phosphorus attacks on June 8 and 9, Raqqa’s main commercial and social avenue—February 23rd Street—reportedly came under three straight days of bombing. Syrian journalist Marwan Hisham, who grew up in that city, recalls how that street had once been lined with cafes, entertainment venues, and shops. Its western edge runs into Rashid Park, one of the city’s main public spaces. Its eastern edge stretches to the ancient Abbasid Wall. Between June 9 and June 11, as many as 10 civilians were killed in repeated bombings of February 23rd Street and its major intersections, according to reports compiled by Airwars. (These sorts of air strikes, ostensibly aimed at limiting the mobility of ISIS fighters, were also employed in Mosul, parts of which are now in ruins.) On those same days, four adults and four children were reportedly killed in airstrikes on Raqqa’s industrial district, another 21 civilians were killed in the west of the city, and at least 11 more civilians, again including children, when airstrikes reportedly destroyed homes on al-Nour street, which is just around the corner from the al-Rayan Bakery, bombed less than two weeks later. On that day, June 21, a Raqqa resident named Abu Ahmad was returning from getting water at a nearby well when, he later told Reuters, he began hearing people screaming as houses crumbled. He said that as many as 30 people had died when the apartment flats around the bakery were leveled. “We couldn’t even do anything,” he added. “The rocket launchers, the warplanes. We left them to die under the rubble.” Only a few days earlier, coalition warplanes had destroyed another source of bread, the al-Nadeer bakery on al-Mansour Street, one of Raqqa’s oldest thoroughfares. In July, the US-led coalition bombed the ancient Abbasid Wall, and US-backed troops breached Raqqa’s Old City. US advisers began to operate inside Raqqa, calling in more airstrikes from there. More and more names, photographs, and stories of the coalition’s victims were smuggled out by local journalists. According to these reports, on July 2, Jamila Ali al-Abdullah, her three children, and up to 10 of her neighbors were killed in her neighborhood. On July 3, at least three families were killed, including Yasser al-Abdullah and his four children, A’ssaf, Zain, Jude, and Rimas. On July 5, an elderly man named Yasin died in an airstrike on al-Mansour Street. On July 6, Anwar Hassan al-Hariri was killed along with her son Mohammed, her daughter Shatha, and her toddler Jana. 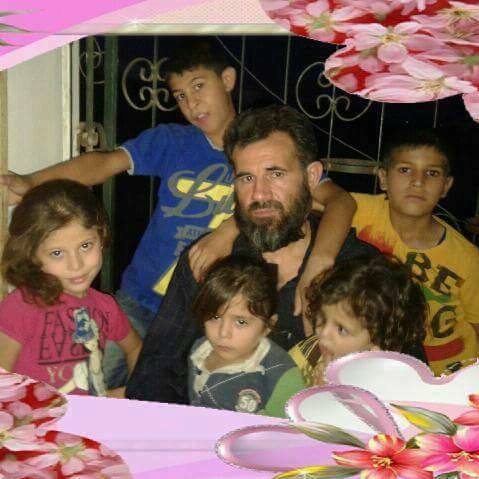 Five members of the al-Sayyed family perished on July 7. Sisters Hazar and Elhan Abdul Aader Shashan died in their home on July 12, while seven members of the Ba’anat family were killed on July 13, as was Marwan al-Salama and at least ten of his family members on July 17. Hundreds more were reportedly wounded, including Isma’il Ali al-Thlaji, a child who lost his eyesight and his right hand. And these are, of course, only some of the reported names of those killed by the US-led coalition. For those who survive, conditions inside the city only continue to worsen. Coalition bombing reportedly destroyed the two main pipes carrying water into the city in the 100-degree July heat, forcing people to venture to the banks of the Euphrates, where at least 27 have been reportedly killed by US-led bombing while filling up jugs of water. The United States has launched nearly 95% of all coalition airstrikes in Syria in recent months, meaning the campaign is, in fact, almost exclusively an American affair. “The French and British are launching about half a dozen strikes a week now,” Chris Woods, director of Airwars, explained to me. “The Belgians maybe one or two a week.” In comparison, in Raqqa province last month the United States launched about 20 air or artillery strikes every single day. In June alone, the US-led coalition and US Marines fired or dropped approximately 4,400 munitions on Raqqa and its surrounding villages. According to Mark Hiznay, the associate director of Human Rights Watch’s arms division, these munitions included 250-pound precision-guided small diameter bombs, as well as MK-80 bombs, which weigh between 500 and 2,000 pounds and are equipped with precision-guided kits. The bombs are dropped by B-52 bombers and other warplanes, most taking off from the al-Udeid Air Base in Qatar, Incirlik Air Base in Turkey, or the USS George H.W. Bush, an aircraft carrier stationed off Syria’s coast in the eastern Mediterranean. Hundreds of US Marines, most likely from the 24th Marine Expeditionary Unit, are also positioned outside Raqqa and are firing high explosive artillery rounds into the city from M777 Howitzers. In late June, the Marines’s official Twitter feed boasted that they were conducting artillery fire in support of US-backed troops 24 hours a day. The result of this type of warfare, says Airwars’ Chris Woods, is a staggering increase in civilian casualties. According to an analysis by the group, since President Trump took office six months ago, the US-led campaign has reportedly killed nearly as many civilians in Syria and Iraq as were killed in the previous two and a half years of the Obama administration. As of mid-July, according to Wassim Abdo, Tabqa still has neither running water nor electricity, even though displaced families have begun returning to their homes. There’s a shortage of bread, and still no functioning schools or hospitals. The Tabqa Dam, which once generated up to 20% of Syria’s electricity, remains inoperable. (US-led coalition airstrikes reportedly damaged the structure repeatedly in February and March, when they burned the main control room, causing the United Nations to warn of a threat of catastrophic flooding downstream.) The US-backed troops in Tabqa have, according to Abdo, banned the Internet and US officials admit that children in the area are being infected by diseases carried by flies feeding off corpses still buried in the rubble. Meanwhile, less than 30 miles to the east, the battle for control of Raqqa continues with tens of thousands of civilians still trapped inside the besieged city. Lieutenant General Stephen Townsend has indicated that the US-led coalition may soon increase the rate of airstrikes there yet again.